We’re celebrating the Month of Pride here at The Fox with a all that glitters Cocktail of The Month. The Fabulous Fox is the perfect accompaniment for anybody. Great for sipping alongside nibbles or celebrating with our live music weekends! It’s a mix of fresh strawberry puree & prosecco, a sweet but tangy twist, perfect to celebrate all that is Pride. Get down for a tipple, it’s running throughout the whole month! Have you joined us for our Live Music weekends yet? There’s always a time to celebrate here with us at The Fox! Every Friday and Saturday we play up an acoustic treat for you, Friday’s are home to our lovely Charly Houston and on Saturdays we’ve got another treat with Scarlett Randle singing for you all. Start your weekend off with your famous brunch, follow it up with our lunch choices and why not join us for a meal in the evening? We’ve got plenty of fizz and nibbles to go round! Join us for a boogie, we’ll supply the entertainment. Our ever popular Fox After Four menu is getting a revamp! 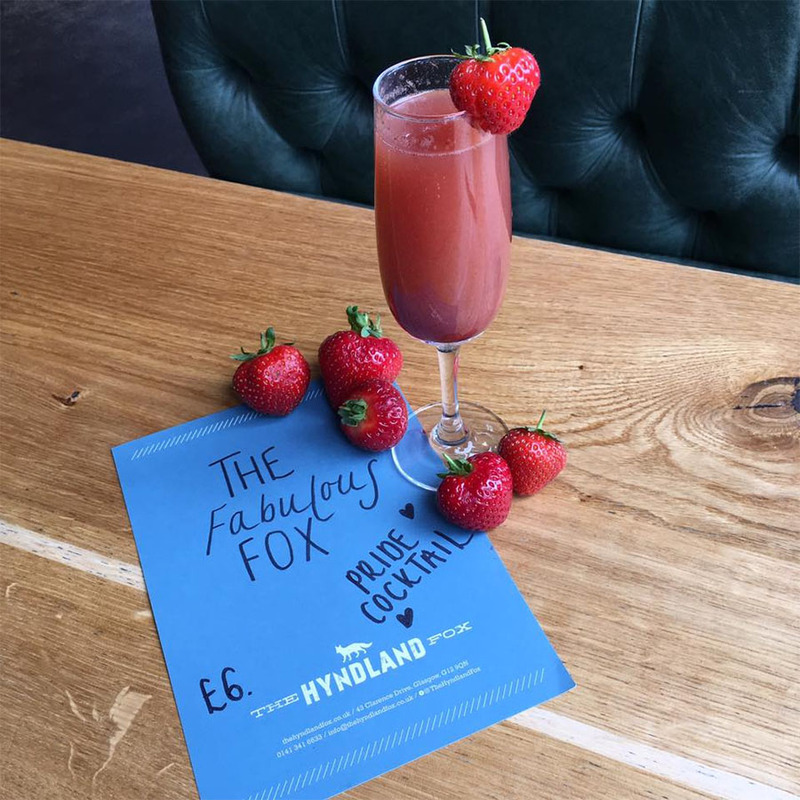 This menu is a delicious upgrade from our A La Carte menu offering you handpicked flavours and a crafted three-course delight, designed by our Chef’s, made with creative touches and delivered to you by the Foxes. We don’t want to give away all our secrets, but here’s a little treat – we’re excited for the Squid Ink & Battered Cod on a kimchi rosti, which will be accompanying many other delights on this menu! The three-course menu is £25, but you’re more than welcome to pick & choose, you can have whatever you fancy! The new menu is launching Friday 25th of August! Keep your eyes and ears peeled on our social media as we reveal this mouthwatering menu to you – get a table booked now, be the first to try it! The Fox does strEAT party! Calling all Glasgow StrEAT Food lovers! The Fox is joining a selection of our West End pals for the Vinicombe strEAT party! Sunday 28th of August have a wander down Byers Road and pop to Hillhead Bookclub for a handcrafted selection of delights for you to feast upon! There will be plenty to eat & drink, along with live music, face painting, stalls galore and a after party for all those who don’t have school in the morning and fancy a boogie! Have a look at Hillhead Bookclubs event page for more information – we can’t wait to see you all there!